Plugin 2.0 Integrates DevOps and ITSM processes closing the automation loop in the last mile of DevOps. To fulfill the vision of DevOps, seamless integration between Application Development and IT Operations is essential,” said Sam Melehy, Zefflin CEO. The Plugin 2.0 provides a cost-effective way to do this by integrating two world-class tools. 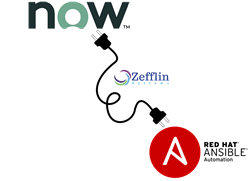 Closing the automation loop for the application development lifecycle, cloud automation, ITSM and DevOps solutions firm Zefflin Systems today announced the next generation Release 2.0 of its ServiceNow® Plugin for Red Hat® Ansible. Integration of DevOps and ITSM processes represents the last mile of DevOps where the automation loop is truly closed between request and deployment processes. Zefflin’s Plugin Release 2.0 enables use of ServiceNow Catalog and Request management modules to (i) facilitate deployment options for users; (ii) capture requests and route them for approval; and (iii) invoke Ansible playbooks to auto-deploy server, storage and networking. In addition to Catalog and Request Management, Zefflin’s Plugin 2.0 provides full integration to ServiceNow Change Management for complete ITIL-compliant auditability and updates the CMDB to record topology of deployed applications, infrastructure and Incident Management to enunciate and assign support if the deployment is unsuccessful. *Support for AWX. Now customers who use the open source version of Ansible can easily integrate into ServiceNow. *Automated Catalog Variable Creation. Zefflin’s Plugin 2.0 reads the target Ansible playbook and automatically creates the input variables in the ServiceNow catalog entry. This exciting feature significantly reduces implementation time and maintenance effort. New playbooks can be onboarded in less time. *Update to Ansible Job Completion. Zefflin’s Plugin 2.0 extends the amount of information returned from an Ansible playbook and logged into the ServiceNow request. This enhancement dramatically improves the audit trail and provides a higher degree of process control. Zefflin is a technical consulting and software company. As a solutions integrator, we are experts in cloud transformation and automation of the enterprise computing environment from application development to IT operations. Our focus is on data center automation, IT Service Management, public and private cloud solution implementation and integration. We work with Fortune 1000 companies across multiple vertical markets. Zefflin is a ServiceNow Sales and Services Partner and a Red Hat Advanced Business Partner with a combined 26 accreditations in CloudForms, OpenShift, Ansible and Ceph Storage. We offer advanced, cost effective solutions to our customers in the areas of request/catalog management, automated provisioning (OS, application, database, storage, and network), policy governance and compliance for the entire computing infrastructure.